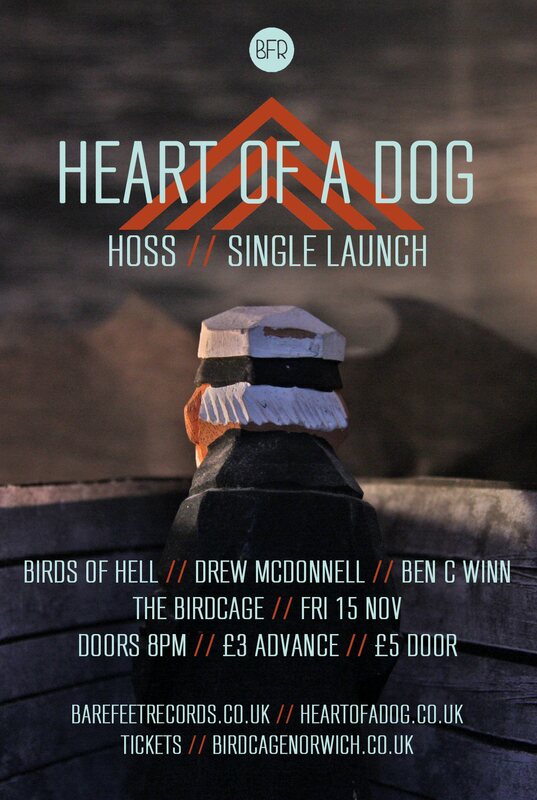 This was a gig I’d been looking forward to for some time, I’d heard really good things about this latest release from Heart of a Dog and so “HOSS” was launched at a brilliant Bare Feet Records (BFR) presentation at the wonderful Birdcage in Norwich. Opening proceedings was Drew McDonnell, playing quiet and subtle, melancholy songs initially with his guitar but for the final three numbers sat at the pub piano. Delicate and rather sad they are well played, and the first song ended with a slightly unexpected and wonderful bit of blues on slide guitar. Birds of Hell (Pete Murdoch) was up next. Anyone who reads this blog will know I am quite a fan and love the ever-evolving arrangements, wit and darkness of the songs. Tonight he played some familiar ones, in facepaint and barefoot to control the pedals, he has a self-deprecating humour but a wonderful musical talent. A super set was extremely well received and finishing with the ever more sinister sounding Boa Constrictor he deservedly got a rapturous ovation. I’m not too sure how many in the room had seen Ben C. Winn (also from Sargasso Trio) before, or knew what to expect from his brilliantly witty poems but I love what he does, and very clearly so did everyone else present. People were literally crying with laughter during “Thnaks”, “Bad Hand” and many more, plus I also heard a few for the first time tonight, including the wonderful “New Coat”. Much in the way that John Cooper Clarke used to appear on the same bill as bands in the punk years, Ben’s style of poetry fits in perfectly at such gigs, with his musical accompaniment nothing is overdone but he had us all in the palm of his hand tonight. Absolutely fantastic! Shortly after 11pm Heart of a Dog took to the stage for their big day, tonight as a five piece with Will on piano, Iain on bass, and Mark on guitar joining Sam and Jon. It transpired that Sam’s parents were suprise guests in the audience and Sam was the most surprised of all but they must have been so proud as HOAD delivered a beautifully played set with a mix and the new and the old. I was extremely taken with the new song they played tonight and the full Birdcage music room were loving it too. By now the windows were full of condensation which the band marked with their logo! Sam explained that there was no physical CD as they were launching just the song itself, but that they had hand printed some art prints, tote bags and t-shirts to accompany the download which is officially released on Monday (18th). I bought myself a limited edition and numbered art print. Hoss itself was performed flawlessly and is indeed something quite lovely and masterful. This is a band really on the top of their game and I love the way they are developing, progressing and evolving. Gorgeous stuff, melodic, thoughtful, observational and very well crafted songs. I gather we also have a rather special video (seven months in the making) to look forward to as well. This track they’ve created is a thing of genuine beauty. HEART OF A DOG launching their new single HOSS. Born in the West Midlands, exiled to East Anglia. A lapsed duo, now joined by a interchangeable line-up of guest musicians and silent partners. Birds Of Hell is the solo project of Pete Murdoch from Sargasso Trio. Delivered over bluesy folk guitar, you can expect vocodaized children’s songs, a duet with his dead grandma and songs about family, a mouldy fridge and Clint Eastwood. Hailing from Saint Faiths, Norfolk (“a small village popular for cremations”); these are tall tales “from the perspective of others”. Sung in the form of alternative country and folk tunes about neglected lovers, tortured souls and weary travelers. Played with an overdriven slide guitar, layered synths and programmed beats. This entry was posted in bands and new releases, Birds of Hell, live music and dance and tagged bare feet records, Ben C. Winn, bfr, birds of hell, blues, drew mcdonnell, folk, heart of a dog, HOSS, live music, norwich, pete murdoch, photos, pictures, poetry, review, single launch, the birdcage. Bookmark the permalink.